Eastertide is fifty day period from Easter to Pentecost. It is celebrated as a single joyful feast. Each Sunday of the season is treated as a Sunday of Easter, and, after the Sunday of the Resurrection, they are named Second Sunday of Easter, Third Sunday of Easter, etc. up to the Seventh Sunday of Easter, while the whole fifty-day period concludes with Pentecost Sunday. The first 40 days end with the feast of Ascension, which is celebrated on the Thursday of the sixth week of Resurrection. This 40-day period is dedicated to the mystery of the various and numerous appearances of the resurrected Savior. During the forty days between His Resurrection and Ascension, Jesus Christ appeared and showed Himself to his disciples and prepared them for the task of carrying on His work and preaching His Gospel. He did this in each one of the appearances described in the Gospels (Luke 24:13-35, John 20:19-23, 24-31). Jesus Christ was on earth after He was raised from the dead, He showed Himself to many people. 5. To His followers toward evening (Luke 24:33-36). 6. To the two followers on the road to Emmaus (Luke 24:13-31). 7. To all the apostles eight days after His Resurrection (John 20:26). 8. To seven by the lake of Tiberias (John 21:1-23). 11. To Stephen outside Jerusalem (Acts 7:55). 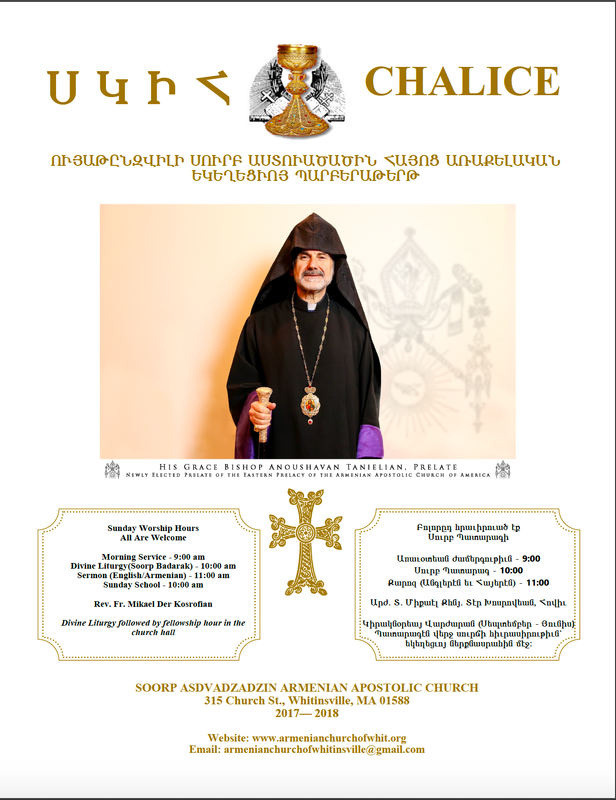 The Armenian Church has four feast days in honor of the Holy Cross of our Lord Jesus Christ. On the Thursday forty days after Easter, the Armenian Church celebrates the Feast of the Ascension (Luke 24:41-53, Matt. 28:16-20, Acts 1:6-14). “Go to all peoples everywhere and make them my disciples: baptize them in the name of the Father, the Son, and the Holy Spirit, and teach them to obey everything I have commanded you. And I will be with you always to the end of the age” (Matt. 28:19-20). a. Jesus’ Ascension is the crown of His earthly mission. b. The Ascension marks God’s acceptance of the Son’s whole work of redemption/reparation. d. Jesus’ Ascension and entrance through the gates of God, His Father’s Kingdom, opens the door of the Kingdom/everlasting life to humanity. On the tenth day after the Ascension and on the fiftieth day of the Resurrection is the Feast of Pentecost, the Sunday of the coming of the Holy Spirit. The Holy Spirit as part of the Three-in-One God has always been and always will be (Genesis 1:1). Each of the Three-in-One God had a part in making the world and in keeping it going (Genesis 1:2, Job 33:4, Colossians 1:16). The Holy Spirit inspired people and gave the Holy Writings to man, inspired people to foresee the future and understand what the Holy Writings meant. The Holy Spirit was doing things before Christ came in the flesh to this earth. The Holy Spirit did things during the time Christ was on earth, is doing things today, and will do things forever.